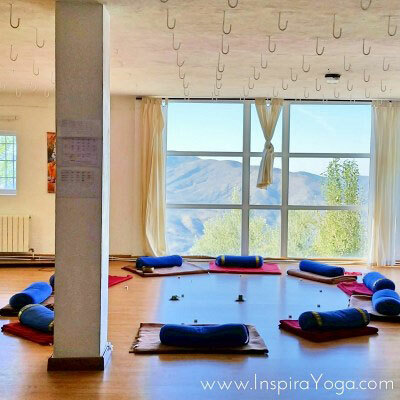 Inspira Yoga offer a 1 year 200 hour Yoga Alliance certified Teacher Training, split between London (6 weekends split over 11 months) and a final intensive week in Spain. The format is perfect for people leading busy lives in London and can still work around other commitments whilst being over a long enough period to really absorb the learning. The final intensive week in Spain is in an absolutely stunning, tranquil setting, perfect for consolidating all of the learnings and putting things into practice. The training is led by renowned yoga teachers Mark Ansari and Raquel Salvador with additional teaching support from Sarah Highfield and special guest teachers including Natalia Mank. Inspira Yoga was founded by Mark Ansari and Raquel Salvador following many years of yoga practice, teaching and training. Mark and Raquel set up Inspira Yoga with an aim to give students the tools they need to shine and discover their full potential in a positive, hands on and encouraging environment, offering yoga teacher trainings and retreats around the world. Inspira Yoga is committed to share the virtues and principles of yoga with a strong emphasis on safety, integrity and personal attention. With this knowledge, new graduates can teach not only from the head, as a result of their studies, but also from the heart, as a result of a deeply felt practice. We have created a teacher training course, which shares our joy of teaching, knowledge and experience with our teacher trainees, so that they may go out into the world and teach with confidence, sensitivity and passion. We pass on the necessary skills and understanding that make our teacher trainees some of the most comprehensively qualified teachers in the world today. This course is not just for people who feel they may want to teach yoga. The course allows you the time and space to take a break from your normal routine and touch base with the deeper levels of your Being. In doing so you are able to transform yourself and your life on many levels. This course touches every aspect of your life; how you live, what you eat, what you think, what you do, how you feel about yourself and the world and will help you to make realistic changes towards a more holistic and yogic lifestyle. Do you want to discover new ways to navigate through life? Do you want to create positive changes in your daily living? Do you want to become self-empowered to maintain a healthy body and mind? Do you want to develop a more intimate and loving relationship with yourself and the world? Do you have a burning desire to learn about yoga and share it with the world? There are many reasons to join Inspira Yoga teacher training. Whatever your reason, as long as you have the fitness (physical and mental) to meet the challenges that the course presents and you are willing to give yourself 100% to a very intensive and rewarding learning experience, please come and join us. There is a £500 deposit to reserve your place, numbers are strictly limited to allow for a very personal and tailored training programme. Special Offer to Light Centre Clients – £200 off the full cost of the training. The Inspira Yoga 200 Hour Yoga Teacher Training takes place over 1 year. The course comprises of 6 weekends in London and a final week in Spain. 11.30-13:00 – Lecture: What is yoga? The final week long intensive in Spain will be dedicated to refining your teaching skills, more in-depth study of yogic philosophy and the final observed practicums. In addition, it will be the perfect opportunity to immerse yourself in the yogic lifestyle surrounded by like-minded fellow yoga teacher trainees. We are currently offering £200 OFF for students who join the course and pay in full by 31st March 2019. Born in London, Mark is a registered E-RYT 500 Yoga Alliance Teacher, he splits his time between UK, Spain, Thailand, India & Bali. He has been teaching yoga since 1995 and is recognised as one of the first Ashtanga yoga teachers to settle and teach regular classes in the UK, having studied directly with Ashtanga yoga founder Pattabhi Jois in Mysore, India. In addition to his initial training, Mark has also studied asana, pranayama and meditation with some of the world’s most renowned gurus and teachers such as Clive Sheridan, Narayani Rabinovitch, Derek Ireland & Godfrey Devereux to name but a few. Through his studies, practice and teaching of Ashtanga, he has evolved and in many respects softened in order to allow his students to experience the true essence of the practice, which for Mark is ‘meditation in movement’. From 1996-2008, Mark spent 12 years as senior teacher at the prestigious Life Centre in West London. He was also a mentor on the first few Life Centre teacher training courses in 2003. He now teaches on retreats, workshops and teacher training courses in worldwide destinations including UK, Spain, Thailand & India. “I have a strong passion for Ashtanga as a Hatha yoga practice and a path of meditation. I am also exploring other techniques to reach those higher states of consciousness associated with spiritual practice”. Mark is the author of the book ‘Yoga for Beginners’ (1997), one of the early yoga books written offering an introduction to Ashtanga yoga. Raquel was born in Spain and moved to London in 1999 where she started her yoga practice. She quickly noticed profound effects occurring through her varied Hatha yoga practices, not just physically but emotionally and spiritually as well. Seeking to deepen her knowledge of yoga she undertook a 1 year teacher training course in 2007 in London, followed by further training in Mysore, India. She has studied with both Siva Rai & Jeff Phoenix, who have been influential in the development of her Vinyasa Flow style. During this period of study she met and started teaching with Mark Ansari. Their passion for yoga, life and teaching is evident in their international classes, retreats and trainings. As a long time yoga practitioner, Raquel has been able to digest the mental, physical, emotional and spiritual knowledge and wisdom that surrounds traditional yoga. In her teaching, she translates her personal understandings with a fresh and relaxed approach. Her particular area of interest is yoga philosophy & the human mind, both of which she has studied extensively. She has a talent for directing students deeper into their own experience on the mat and encouraging a greater awareness of yogic principles that can be applied to daily living. Born in Hong Kong and currently living in London, Sarah has been practising Ashtanga, Vinyasa Flow and Hatha yoga for over 10 years and teaching since 2015. She runs her brand Yogagise and teaches privately across London and in studios (Bodyism, Edge and Form Studios). Additionally, she works with the exclusive Helios Retreats, at special events and other brand collaborations. As a Londoner, Sarah believes there is no better way to retreat from the stresses of city life than to roll out her mat, open up, stretch out and quieten the mind. She emphasizes that practicing yoga is a form of self-love & realisation, it is a wonderful way to tune into the body and mind. As a committed teacher, she relishes being able to assist and inspire others on their yoga journey. Her classes promote wellness, energise the body, develop strength, increase flexibility and ultimately relax the mind. Natalia first came into contact with yoga in 2001 at Warsaw University, Poland where she studied Cross-Cultural relations between Western and Oriental civilisations. In a hectic life filled with full-time teaching, intense study and partying, yoga was a breath of fresh air and a much-needed call from within. It was love at first sight, one that propelled her to travel solo to India for three months in 2002. During that first trip, Natalia visited South Indian ashrams and became deeply fascinated by yoga philosophy and the scholarly approach to the spiritual. In 2003 she enrolled in a five-year Master’s degree in Indian Studies at the University of Warsaw. Majoring in Sanskrit and Indian philosophy; her final dissertation focused on Tantra and the relationship between the guru and the student in tantric initiation rituals. She also received a scholarship from the government of India to practice Bhratanatyam – classical Indian dance, in an internationally renowned Kalakshetra Academy of Performing Arts in Chennai, where she studied for two years. Although injury prevented her from continuing a dance career, she continued to practice yoga in India and treated it as a medium of healing and introspection. Upon graduation Natalia moved to Madrid, Spain in 2008 where she committed to Ashtanga yoga at Mysore House, as taught by Pattabhi Jois. In Spain, she started giving classes and workshops in Indian philosophy, Sanskrit and chanting. After relocating to London in 2014, she began to search for yoga teacher training that would complement her previous studies. The perfect solution came in the form of Inspira Yoga, where she completed her 200 hour Yoga Teacher Training in 2017. For Natalia, yoga is the path of self-enquiry, acceptance and living the balance between continuous learning and letting go of expectations; she conveys this to her students guiding them gently and effectively in their practice. Natalia has also completed her Prenatal, Postnatal, Baby Yoga & Massage teacher training.